Enhanced output of a giant magnetoresistance device for hard disc drive application. Assistant Prof. T. Kubota and Prof. K. Takanashi of IMR, Tohoku University have succeeded in enhancing the output of a current perpendicular to film plane giant magnetoresistance (CPP-GMR) device using a new non-magnetic spacer layer material, Ag-Mg alloy. Observed resistance change of the CPP-GMR device was 1.7 times larger than that observed in conventional devices using a Ag-spacer layer, which can contribute to the development of hard-disc drives for the next generation. This achievement was published in Applied Physics Express on 27th May, 2015, and was selected as a “Spotlights” article. 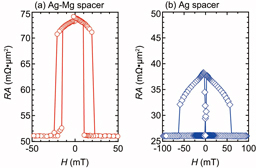 Magnetoresistance curves using new spacer layer material (left), and the conventional Ag-spacer layer (right). Copyright (2015) The Japan Society of Applied Physics.